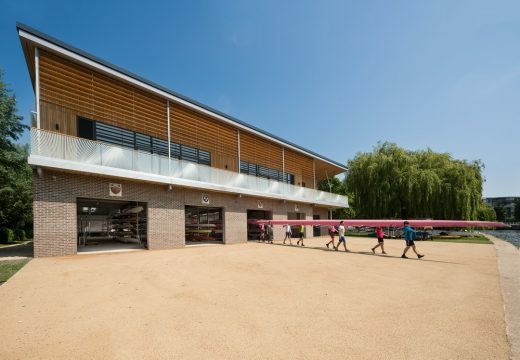 R H Partnership Architects (RHP) has completed work on a new boathouse for the combined Cambridge Colleges of Churchill, King’s and Selwyn, together with The Leys School. 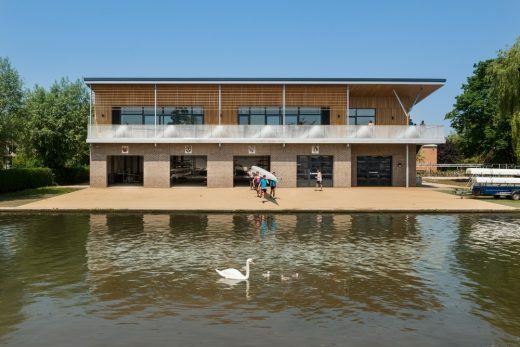 Located on the banks of the River Cam, it replaces the previous 60s built boathouse which was considered by the Local Authority to be a ‘building that detracted’ from the Riverside Conservation Area. The old building had an industrial aesthetic and lacked the appeal and character of other boathouses along the river. It was also in need of considerable repair and refurbishment to meet current standards. The RHP design has provided much improved facilities for the clubs, moving all of the environmentally controlled accommodation out of the flood zone. Changing rooms, fitness rooms and the four Club Rooms are all now housed on the first floor, leaving only the garage style spaces of boat storage bays and the boatman’s workshop at the ground level where the detailing, services and materials have been robustly designed for resilience to flooding and to ensure ease of cleaning-out and safety in wet conditions. The Cam side site is prone to flooding of up to 1m in height and there were tight limits on the volume of flood zone capacity that could be used. 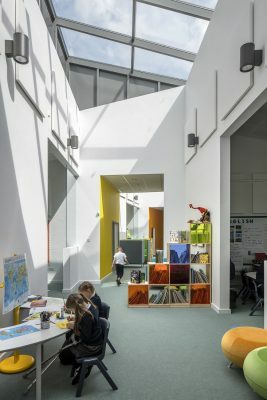 Development and infrastructure consultancy, Peter Brett Associates were a key part of the team involved with delivering the project, garnering agreement from the Environment Agency for their Flood Risk Assessment and delivering the Flood Evacuation Plan. 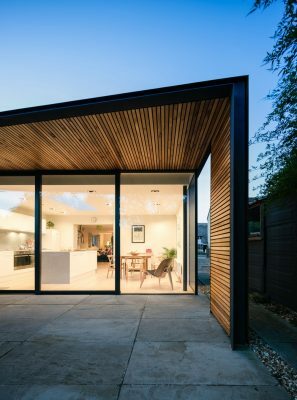 The finished building incorporates traditional materials with crisp detailing, resulting in an elegant composition of a lighter upper floor above a more robust and solid base. 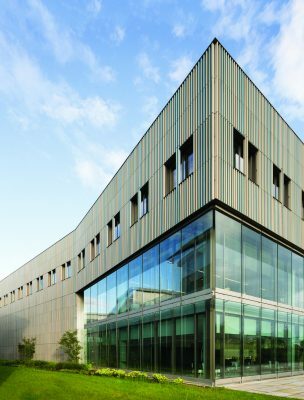 The expressed ridge and balcony lines, together with solar shading elements provide a floating horizontal emphasis reflecting the proportions of slender rowing boats. The deeper corner balcony area and roof overhang is supported by an expressed column with reference to blades and boat riggers. 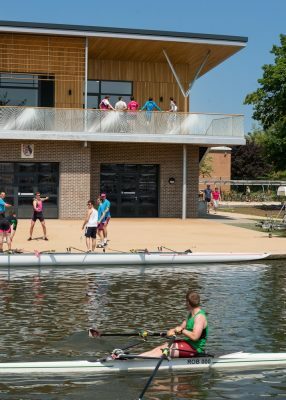 Renowned glass artist Kate Maestri was commissioned to create a glazed balustrade design which reflects the pattern and rhythm of rowing blades when completing a stroke. 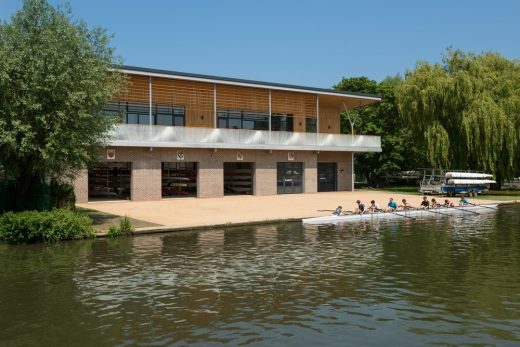 The Combined Colleges Boathouse has now been handed over and is fully operational. 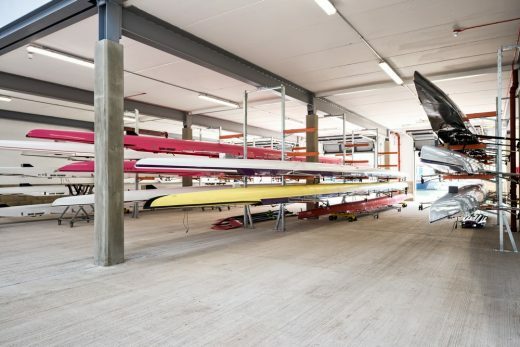 Four bays of the building provide storage for rowing boats for four colleges and a fifth bay acts as a workshop. The ground level is encased by brick and designed to deal with flooding. 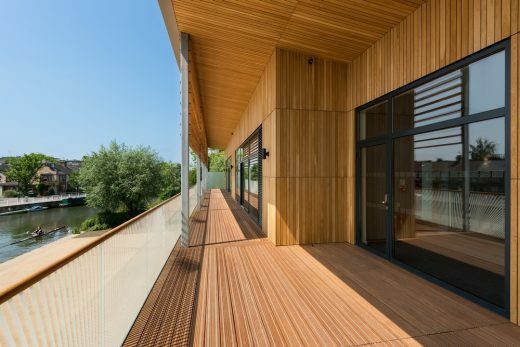 This is surmounted by a lighter weight structure clad in oak panelling that accommodates changing and fitness rooms that overlook a generous terrace. These are supported by the clubrooms at the rear that visually form part of the brick base and create the very successful and well composed east elevation to the building. The detailing is of high quality throughout. 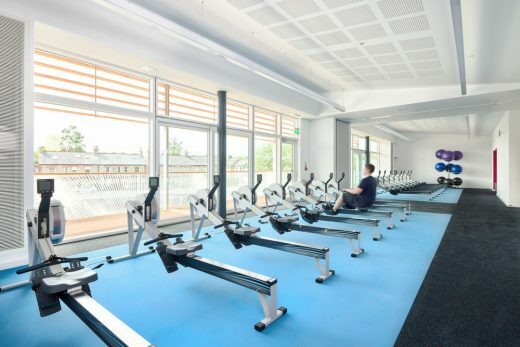 However, the homage to rowing, in the details and construction, elevates this and helps turn the building into something specific to its use. The overall roof form is a succession of angled planes suggesting movement and the stairs to the loggia further emphasise this. 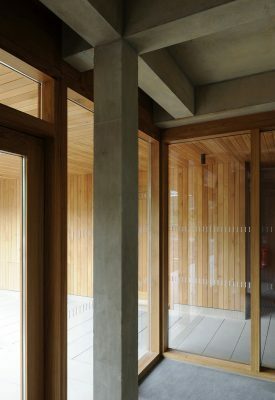 More specifically the ‘final column on the first floor loggia has a timber base shaped like an oar with the ‘V’ shaped steel structure reflecting the pattern of oar blades or boat riggers. This theme is carried on with the glazed balustrade from a design commissioned by glass artist Kate Maestri. Overall this is well conceived and delightful addition to the River Cam’s frontage for what is a very simple building type but which, in this case, has been elevated into something special.